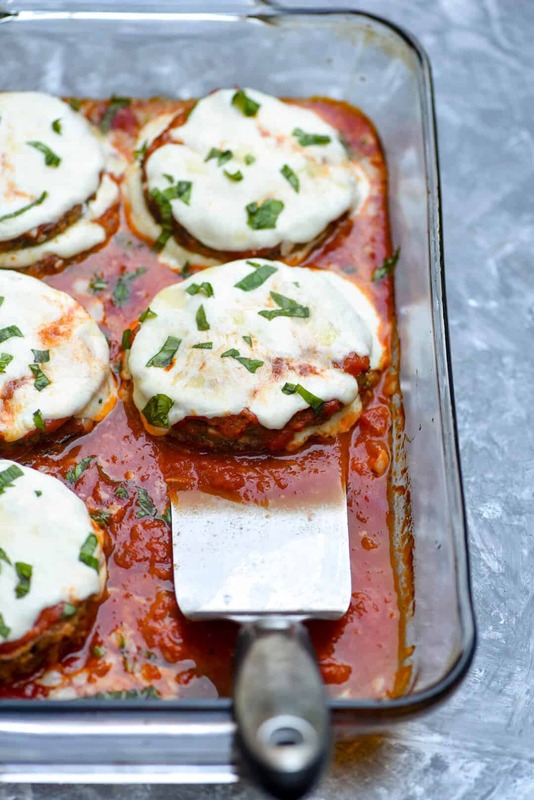 An oven-fry method creates this crispy Baked Eggplant Parmesan that rivals any fried version. An easy, updated take on the classic Italian dish. This post was originally published on September 11, 2011. It has been updated with new photos and an instructional video. Aaahhh, cheesy Baked Eggplant Parmesan. One of my husband’s favorites. I remember making it for the first time ages ago and wondering how my kids would perceive it. I mean, there’s no meat in it! Not necessarily an easy selling point to four teenage boys. Because it resembles lasagna they dove right in without even asking what it was… and it was love at first bite. So, there you go! 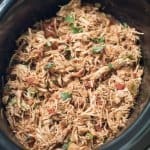 I find this method is easier to prepare than the traditional fried version and it’s definitely a little easier on the waistline without forfeiting any of the delicious flavor or texture. Try it and you’ll see. Don’t sweat the small stuff…. but definitely sweat your eggplant! Eggplant can have bitterness to it and this process of “sweating” helps eliminate that. Not all of them will have that bitter element, but to me it’s not worth the risk so I always take this extra step. Sweating is the process of salting your eggplant slices and allowing them to rest for about an hour or more. The salt will pull some of the potentially bitter liquid from the eggplant. Less moisture in the eggplant slices also helps them to crisp up nicely in the “oven-fry” method in this recipe. Once they’ve sweat, just be sure to rinse them well with cool water to remove the excess salt and blot them dry before breading them. Whether you peel them is personal preference. It isn’t necessary and I love the deep purple color not to mention that there are vitamins and additional flavor in the skin. I’ve done it both ways but took the easy way out here and left the skin on. You could mix things up by using different varieties of Italian cheese but for this recipe I always go with sliced fresh mozzarella and a little Parmesan. 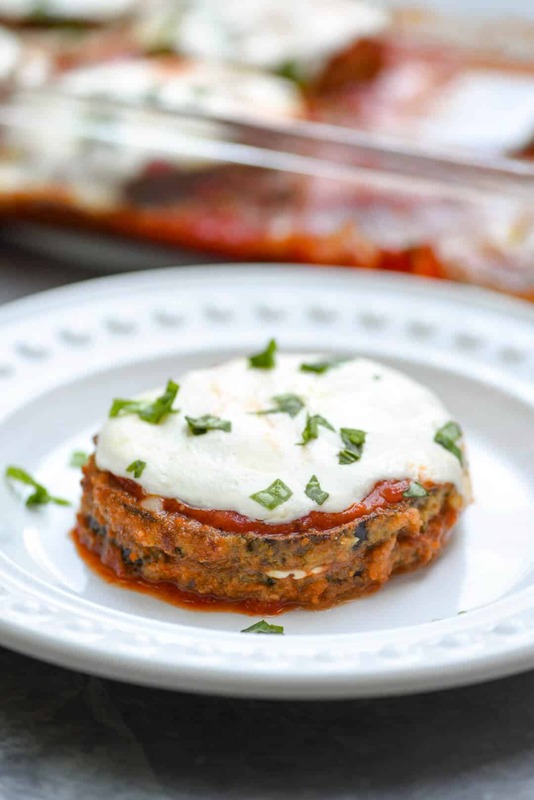 The fresh mozz has such a luscious, creamy quality and layers nicely on the eggplant stacks. This is one of our favorite Italian-inspired meals in this house. I’ve made it countless times and it remains at the top of the list! Sprinkle some salt on both sides of each slice of eggplant. Layer the slices in a colander and place the colander in your sink. Place a heavy dish or pan over the top to press them down. Allow to sweat for 30 to 45 minutes. Rinse well with cold water to remove salt and blot dry with paper towels. Preheat oven to 400 degrees. Spray a rimmed baking sheet generously with cooking spray. Dip eggplant slices in egg, then in bread crumbs, pressing crumbs down with fingers if needed to cover evenly. Place in a single layer on oiled baking sheet and lightly spray tops of breaded eggplant with cooking spray. Bake in preheated oven for 10 minutes then carefully flip each slice and cook an additional 5 to 10 minutes, until nicely browned. Remove from oven and reduce oven temperature to 350 degrees. In a 9x13 inch baking dish spread just enough marinara to cover bottom of dish. Place a layer of eggplant slices in the sauce. 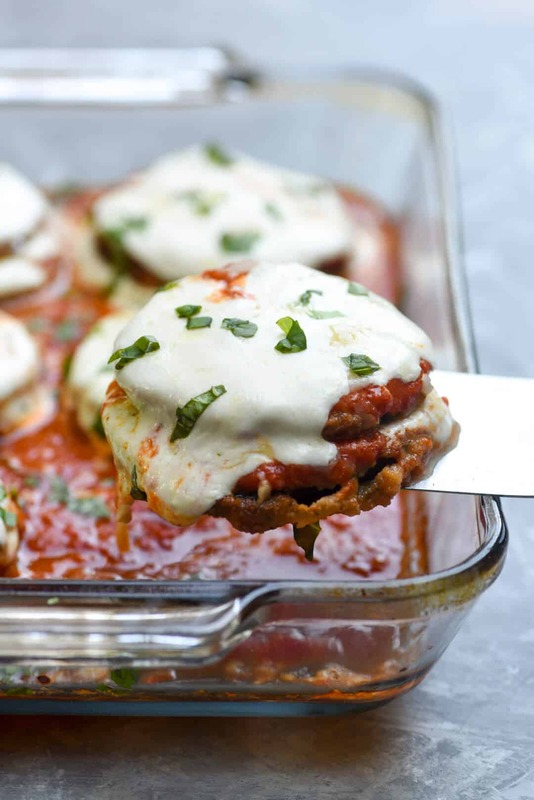 Cover each slice with a spoon full of marinara, a slice or two of mozzarella, and then sprinkle with parmesan cheese. Repeat with one more layer. 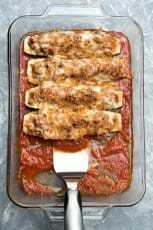 Pour any leftover marinara and around edges of eggplant slices and top with any cheese that is left. Sprinkle basil on top. 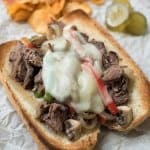 This is one of the worst food websites I have come across. There is no focus on the recipe it’s all ads. I can understand your frustration, Ann, but without the ads there would be no web site at all. Running a site like this takes a huge amount of time and effort and there are costs involved with recipe development, testing, photography equipment and editing tools, web hosting, and a long list of other items. Ad revenue is the main income stream for most food bloggers and it is how we cover these costs. This is also how we earn our living so of course we have to run ads to make it possible to provide our recipes to our readers at no cost. It’s no big deal to scroll by the ads, and sometimes I actually see one I’m interested in – thanks for a great recipe! This sounds great, we’ll try it soon. Your blog is wonderful. Thanks Bill 🙂 Have a great weekend! At what temp do you bake the assembled dish? When you remove the breaded eggplant slices from the oven, you will reduce the oven temp down to 350. Then the assembled dish goes back into the oven and bakes at 350 degrees. Good catch Laura! Thank you and enjoy! Valerie … just discovered your wonderful blog through a friend, and can’t tell you how much I enjoyed the eggplant recipe and cannot wait to try it. However, if at all possible, could you PLEASE include nutirtional values for those of us who are diabetic??? Thank you so very much and God Bless !!! Yes, I like to bake mine too! Much healthier that way! Great post and pics! Making this for a friend tonight, looks delicious, can’t wait to try it.. It looks super yummy! I am a huge eggplant fan but hearing that your kids liked it entices me even more to make it. I have a very, very picky ten year old daughter who is not fond of many vegetables. Luckily, she loves just about anything that has a tomato sauce so I will definitely try this. I’m always on the lookout to boost her vegetable consumption! Did your children realize that it was a vegetable they were eating? Thanks again for the recipe! this looks really yummy and how i am looking to make it. thanks for sharing! How come in my oven the eggplant takes forever to turn brown , i had in in there longer than 25 min and it did not turn brown almost at all. Finally i took it out because it took too long. I did everything like in the recepie. Hello Jowita. In my oven, 20 minutes at 425 degrees is plenty to brown the breaded eggplant slices. Your oven may be different. You can try increasing the oven temp a little or leaving it in longer. FYI, your recipe has 400 degrees shown. So you would reccomend 425? Hi Kathy. I recommend starting it at 400 degrees F but if you find the eggplant is not crisping up to your liking, go ahead and up the oven temp to 425. Thank you for this great recipe! I love eggplant but hate all the frying (it’s messy and takes forever). Why did I never think of baking them with the breadcrumbs? I will definitely try this recipe. You just made my day! Thanks Carol! I hope it works well for you. I love the baking method. 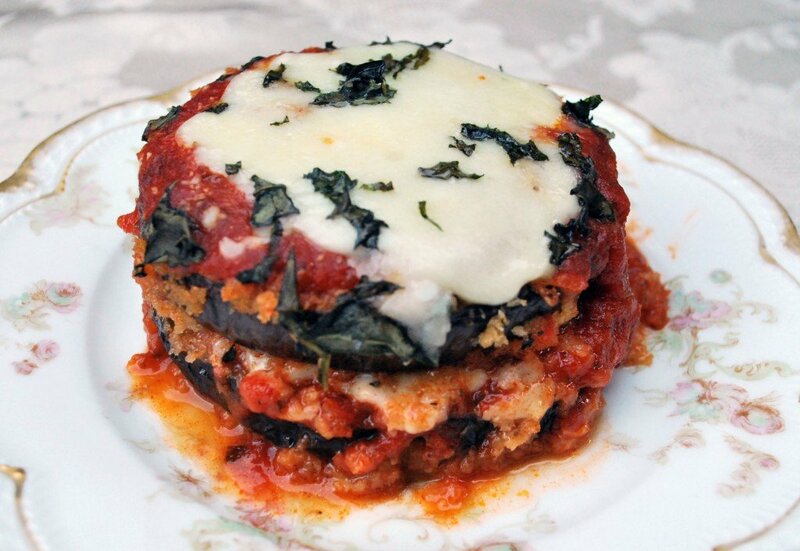 Looking for a good baked eggplant recipe, this one looks great! Am trying this tonight, will get back to you after, but it sounds really delicious. Will probably use homemade breadcrumbs, I have fresh tomatoes from the neighbor and an eggplant from her garden, I will probably use a little fresh oregano from my garden. This looks so amazing that it is on my list to try out on my family next week. Absolutely. I think it would be wonderful with a meat sauce. Nice recipe. I’ve never heard of sweating eggplant before breading it, I’m interested to try this out to see how it affects the final product. My only word of advice would be to throw on the fresh basil after it’s come out the oven. I can’t imagine those bits of burnt leaf would taste very good! Also, if you stack four or five basil leaves, roll them up and slice them thinly, you get nice little basil ribbons that are good for garnish and easier to eat 🙂 It’s a technique with a fancy french name that’s fun to say; chiffonade! Hello Jack. Thanks for the helpful comments. I’ve not had a problem with the basil burning but you can absolutely add it after it bakes if you prefer. And, yes, chiffonade is absolutely the most effective and efficient method of slicing basil. Enjoy! WHOA this looks SOOOO good… definitely pinned this recipe, wow. I can’t even look at it anymore, it’s making me too hungry! Your site is great and your pictures are amazing! Very impressive, I’m glad I found you, I’ll be coming back! Great recipe can you please post the stats for the calories , carbs, proteins etc for an average serving size. Hi Melody. I don’t provide nutritional breakdowns but I know there are many tools available online that will do that for you. If you do a search for “recipe nutrition calculator” or something similar, you will find several choices. Can you make this ahead? I have a big dinner party planned and a tiny kitchen, so I would like to prepare in advance if possible. How would you do this? Hi Jade. This recipe is not the best choice for a make-ahead dish. Because the eggplant is breaded, the result is best if it is cooked and served right away. A pasta dish would be a far better choice. I have always served this for large gatherings. I learned your method of oven “frying” from a friend and I love it. I have frozen the fried eggplant between sheets of waxed paper and put them in a ziploc bag, then it is always ready to assemble whenever I want. I’m sure you lose some crispness, but just baking it in the gravy you lose it also. I started this when I grew my own and naturally you have more than you can eat all at once. This gave me my eggplant parmesan hopefully for the rest of the year and the hard part was already done. Hi v..from EVE in ISRAEL… this is eggplant country …. called”HATZILEEM” in HEBREW + so popular her in any + every form . Love it but hates the way it soaks up oil like a sponge…My less oily way tp prepare it is to spareingly BRUSH the thin even slices w oil ( with out the pre salting ) +add seasonings and lay them closely in one layer on the toasting screen of my OLD toaster oven ( yes it makes a mess) I put on the highest heat + they get broiled from both sides takes 20 min. they loose moisture and shrink so u end up with much less than u started with.. +then u do the next batch + the next This does take longer than frying but I hate all that oil, the smell+ cleanup so it’s o k . I NEVER peel . The peel adds great taste Instead i pull a sharp fork lengthwise through the peel which looks llike stripes over the entire egplant. after that I slice. Oh my, does that ever look good! I am a big eggplant fan. Thanks for the shout-out for my eggplant pizzas! Thanks so much, Kalyn. Those pizzas look incredible! Bravo to you for coming up with an easier way to prepare this delicious dish! To those people who do not like this vegetable, the salting process takes out a lot of the bitterness. Also if you choose younger eggplants they will not have a lot of the seeds in them. i have added many of your recipes to my rotation. Keep on cookin girl cause your good at it. I hardly saw anyone that had made this dish, so there really weren’t any reviews, and any time I have done anything with egg plant, it was so much work, that I quit, but I love egg plant, why not have reviews of people that have made this recipe?? Hi Doris. I’m always thrilled when people come back to leave a review after they’ve made one of my recipes but obviously, I have no control over that. Still looking for a review of dish actually cooked myself. assembled and ready to bake..seems like I might have wanted some olive oil on pan instead of spray.. dry.. will see what it comes out like. We did a girls night last night at my galpal Lindsey’s house. We get older, life gets crazier, and before you know it you haven’t seen some of your friends in months. Lindsey made this recipe, modified with gluten free bread crumbs (for me😊). This was phenomenal🙌🏼. She passed the recipe on so I could recreate it at home and I am so glad you went into such detail about salting the eggplant to remove the bitterness. Many moons ago, my first time cooking eggplant at my own place… Was a disaster. I didn’t know I had to ‘cure’ it in a sense, and was left so disappointed. I can not WAIT to make this, and get my very picky eater husband to try! Can this be made and prepared and freeze it for a week. Then make it for xmas. ??? Does adding the sauce at the bottom of the pan make the breaded eggplant soggy? I’ve breaded and fried eggplant before baking with sauce and it gets soggy. Just wondering if the oven-fried version stays crispy. But the dish was good! I had to drive 22 hours and back to get the eggplant? Ha! Thanks for pointing this out. I recently updated to a new recipe card and I’m still coming across these little glitches here and there. It has been fixed! 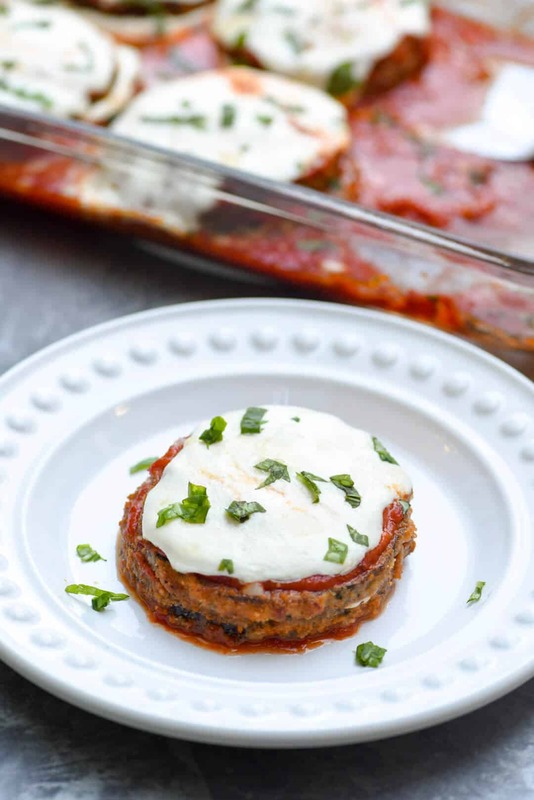 Thank you for sharing this great eggplant parmesan recipe, Valerie! 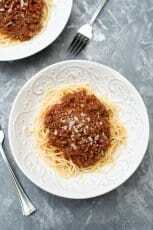 I made it and it turned out SOOO delicious and made plenty so my small family had lots of leftovers, which still tasted great throughout the week 🙂 I made a few very slight modifications, one of which was that I didn’t use any cooking spray. Just put the egg/crumb-covered eggplant slices on a parchment paper lined baking sheet, and they still got nice and crispy. 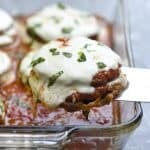 I blogged about the recipe, if you’d like to see the other small modifications I made: http://busymomrecipes.com/dinner/baked-eggplant-parmesan/ We served this over angel hair pasta and totally loved it. Thanks again for the great recipe! HOW TO I PRINT THE RECIPE? Just click the “Print” button on the recipe card at the bottom of the post. I do not cover the eggplant slices with breadcrumbs (I just fry them lightly after dipping them in beaten egg) and use rikotta instead of mozzarella. We call this recipe Moussaka. I will definitely try your method for it looks yummy. Love your recipes. This is delicious and the prep time his half of what a family recipe takes. Thanks! Can I use Ragu pasta sauce instead of Marinara, I don’t want to go to the store tonight. Hi Marie. Use the sauce you like best. I think Ragu pasta sauce should work just fine as long as you’ve got enough. We are not huge eggplant fans, but I bought a beautiful, just picked one from the local farm. Made this recipe and added prosciutto as a layer – easy and delish! Thanks for creating/sharing! I have to say I was skeptical that the eggplant would be crispy & hold up to the sauce once baked but this recipe has proven me wrong. In fact after 3 days in the fridge, they were still somewhat crispy. I will use this recipe over & over, again. Thanks for posting. 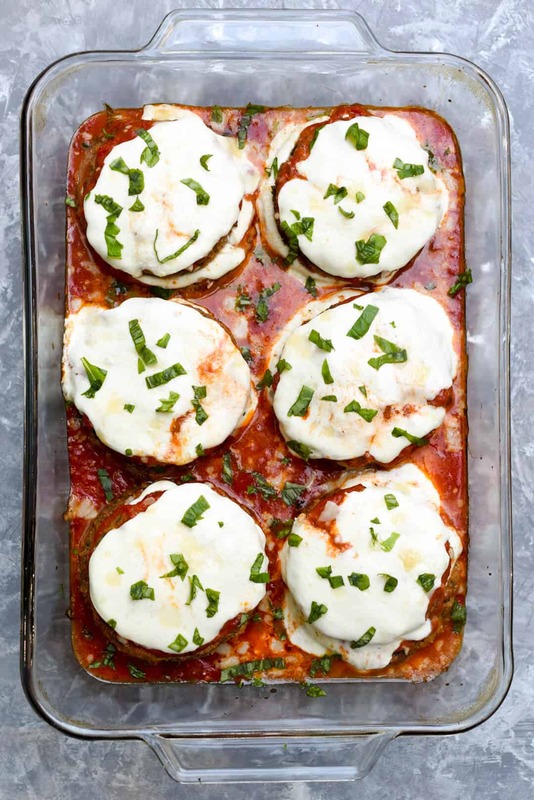 This looks very similar to the way my mother used to make her egg plant Parm. Unfortunately my mother recently died and she took her recipe with her. I remember she used to fry her egg plants that were already breaded and mixed with egg batter prior to baking. Is this something I should try prior to taking step one of your recipe? The nutrition value is calculated automatically through the plugin that is used to create my recipe cards. I always recommend checking nutrition values for any recipe through your own trusted online nutritional calculator or other methods. See my full nutrition disclosure HERE. 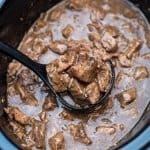 I often search for recipes but rarely comment unless I’m incredibly impressed. Guess what….this recipe knocked my socks off! I arrived home from work at 5, picked 2 eggplants off of my home garden plants and started the process….amazing results! Thank you…..keep up the great work! 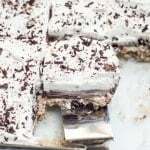 The recipe says double layer, but your picture looks like triple layer. Is it up to the individual? Hi Kathy. I’m not sure which picture you are looking at but it’s just two layers in all the photos and the video. My husband generally turns up his nose whenever I serve eggplant. This year I grew it in the garden. It’s remarably easy to grow. With a bumper crop, and my picky husband in mind, I went in search of new recipies. This was the first one I’ve tried and it was AMAZING! He actually went in for seconds! I can’t thank you enough. Hrew eggplant for the first time this year, it is so amazingly easy -if anything could be easier than tomatoes, this is it! After I picked my three beautiful eggplants I began to realize – I have no real recipes for them! So glad I found this one. Trying it tonight! This dish was amazing! The only thing I’d mention is that the nutrition is way off. I put each ingredient into a food tracker program to track for my day and it add some up to 482 calories for 1 serving. No where even close to the 126 as posted. So even though it was totally delish and I’ll make again, it was not a low calorie dish as expected. Bummer! What a phenominal dish! I made it last night for my vegetable-phobic parnter. It was complete silence while we devoured the first servicing. I loved it even more the next day for lunch. Salting and sweating the eggplant meant zero bitter taste. Pre-baked the slices@ 450 degrees for 12 mins on each side. They didn’t really brown, but it didn’t matter. Everything came out perfectly. Used Trader Joes marinara. Super good and reasonably priced. My veggie critic just texted to ask when I was making it again. Thanks, Valerie! 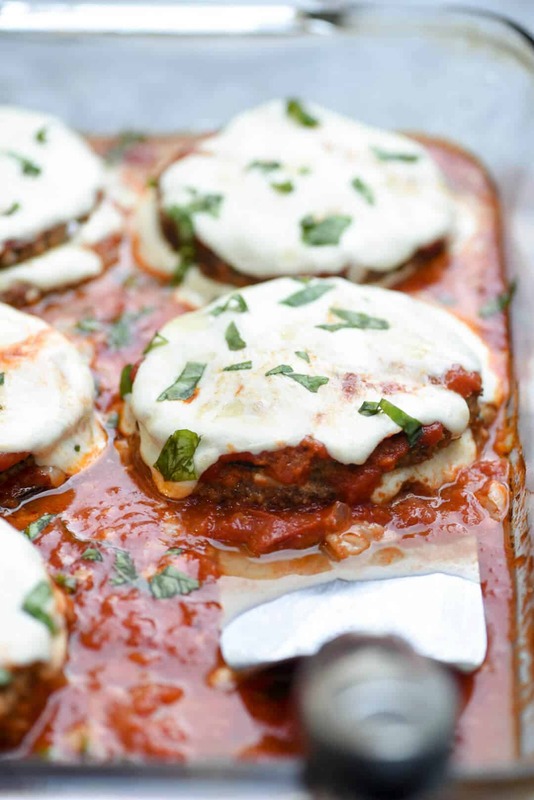 Hello Valerie – thank you for sharing this recipe and the info about sweating the eggplant. I made the dish this evening and am very happy with the outcome. I am indulging in some eggplant while I can. The six-week challenge I begin Monday excludes eggplant from the meal plan. Agin, thanks for sharing!! I purchased some smaller white eggplant from a local farmer the other day. He mentioned they don’t grow large and the flavor is better than the purple. Should I sweat the white eggplant as well? Also, bought a few of the purple. Excited to try them both! Thanks for your detailed recipe and amazing pics! Hi BJ. I’ve never worked with white eggplant but from what I understand they are milder and less bitter than the purple variety. I can’t say for sure whether they would benefit from the sweating process but I did read that they should be peeled for the best result. Also, for anyone else who may come across this comment, there are two varieties of white eggplant, an edible variety and an ornamental variety meant to be used solely for decorating purposes so be sure you’ve got the correct one if you plan to use it in a recipe. I’d love to hear how this works out for you if you end up using the white eggplant. Thanks so much! Hey, just wondering if you could sweat the eggplant slices the night before and keep refrigerated? Hi Janice. I’ve never tried it so can’t say for sure if it would be a good idea or not. My concern would be that the texture of the eggplant could change once it is sliced and open to the air if left for too long. 3 eggplant sliced into 1/4″ slices? And I’ll need 12 slices? That’s 3 inches total–less than one medium eggplant. What do I do with all the rest? One medium eggplant will not yield 12 slices. You might be able to get what you need from two eggplant but I recommend picking up three so you don’t come up short. The video in this post might be helpful to illustrate this. 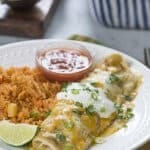 Just wanted to let you know I have made your recipe 3 times and I love it! It saves so much time not having to fry the eggplant and tastes so much lighter and crispier. This is my go-to now. Thanks!!!!! Made this tonight and it was a huge hit! It’s definitely going to be something I cook regularly. I didn’t have breadcrumbs so I didn’t coat the eggplant with anything and it was still incredible. Thanks for the recipe! Absolutely delicious. I made it when my mother-in-law came to visit. Eggplant parm is her fave. This was light an yummy–I did add ricotta cheese to the filling, which made it even yummier. I’ll definitely make it again. Very easy too. Neither myself or my wife have ever had eggplant before, I’m using your recipe now, and am anxious to see how it turns out. Thanks for the post! Yum, I can’t wait to try this – it looks delicious. All that yummy cheese!! Is this freezer friendly? Prepping freezer meals…thank you! I’m making this eggplant recipe tonight. I couldn’t find fresh basil. I bought pesto. I will layer it in. I can tell it will be delicious. My husband and I are generally not eggplant fans. I did a Moroccan dish not too long ago that I liked and he said was OK. Tonight, he legitimately liked it. He did not tolerate it or think it was just fine to have as a healthy alternative. He actually liked it. Thanks for the recipe. Super yum and my 5 yr old gives her approval too. People who claimed to hate eggplant, LOVE THIS DISH! It’s a fantastic recipe. Even my father, raised by Italians from the old country, thinks it’s better than his! I absolutely hated eggplant… Until I made this recipe. Now, it’s the only way to make it! I followed the instructions on sweating with salt. I rinsed it thoroughly but it was so salty we couldn’t eat it. All my money and time was wasted!!!!! I’ve never heard of anyone having an issue with the eggplant being salty after sweating it so I can’t be sure what happened there but I’m sorry it didn’t work out for you, Susie. I made this recipe and it tastes great! But I don’t understand why you needed 3 eggplants. If you are slicing them 1/4” thick and need 12 slices, then 12 X 1/4 = 12/4 = 3 inches. In other words, you would supposedly only need 3 inches of the eggplant, which could easily be fulfilled by 1 eggplant. Are you only using a few inches from the center of each eggplant and not using the rest so that they will all be the same size? I cut up one moderate sized eggplant into 1/4” slices and got enough slices to need 2 pans to bake them all. True, I had to cut up some of the smaller ones and arrange them on the bottom layer to make similar sized layers, but that seems preferable to only taking the centers from 3 different eggplants and wasting the rest. If I had cut up 3 whole eggplants I probably would have had 5 or 6 baking sheets of 1/4 inch slices! I also raised the initial temp to 425° because that’s where I roast most veggies and it worked great! 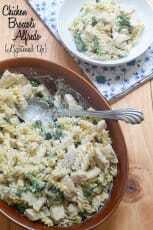 Overall, a wonderfully flavorful and easy meal! We have one restaurant we go to in town because it is the only one that makes a good, crispy Eggplant Parmesan. We all agreed this recipe was even better than that! Also, I’ve made Eggplant Parmesan before by frying the slices on the stovetop. That was a good recipe too, but frying all those slices a few at a time was such a messy, tedious affair that I never made it again. This recipe was so simple that I will be able to make it all the time now. Thanks from my vegetarian husband! Today is Sunday. I am having guests on Thursday evening. I work during the day and want to know if I can prepare the entire tray today and freeze it? Thaw it out Wednesday night and bake it Thursday night. I just finished breading and frying the eggplant slices. They are ready to be layered. Can I freeze these and thaw them the day before then prepare the tray for baking the night the guest come over. My main concern with everything above is will this make the eggplant too mushy when being baked? I haven’t tried freezing it, Paul, so I’m afraid I can’t say for sure. I’ve heard from others that have tried it that it worked out well for them. VALERIE, this eggplant looks amazing! I can’t wait to make it! 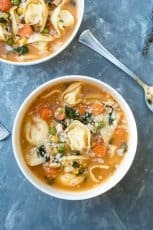 This recipe was a little work but the end result looks amazing and tastes awesome as a lenten meal with zuchini noodles and salad! I’ve used this recipe a few times. Always turns out well! I recently switched to gluten free cooking, and although I had to season my breadcrumbs myself (dried parsley & basil, onion powder, garlic powder & salt!) and bake the eggplant slices a little longer and with a little more oil sprayed on, it was fantastic. Valerie, absolutely loved this! Made a few tweaks, as I literally never follow a recipe 100%, but this was so yummy I will actually make it again! Thank you! Loved the flavor of this recipe!! It may just be me, but I found 3 eggplants to be too much for the amount required and 2 did just fine. Definitely will make again! This is my second time making this eggplant parm. It’s definitely a keeper, it’s just delicious. Thank you Valerie. I have spent years the old school frying way! Never again! This was perfect!